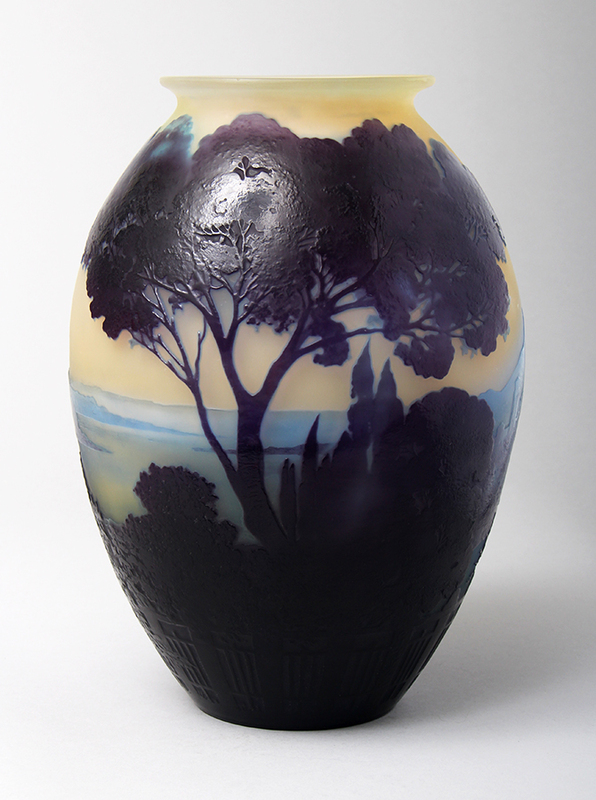 Bonham’s Los Angeles held a 20th Century Decorative Arts sale yesterday, April 29, 2015. The offerings were more or less mediocre, but there were a few goodies mixed in — and they did well. 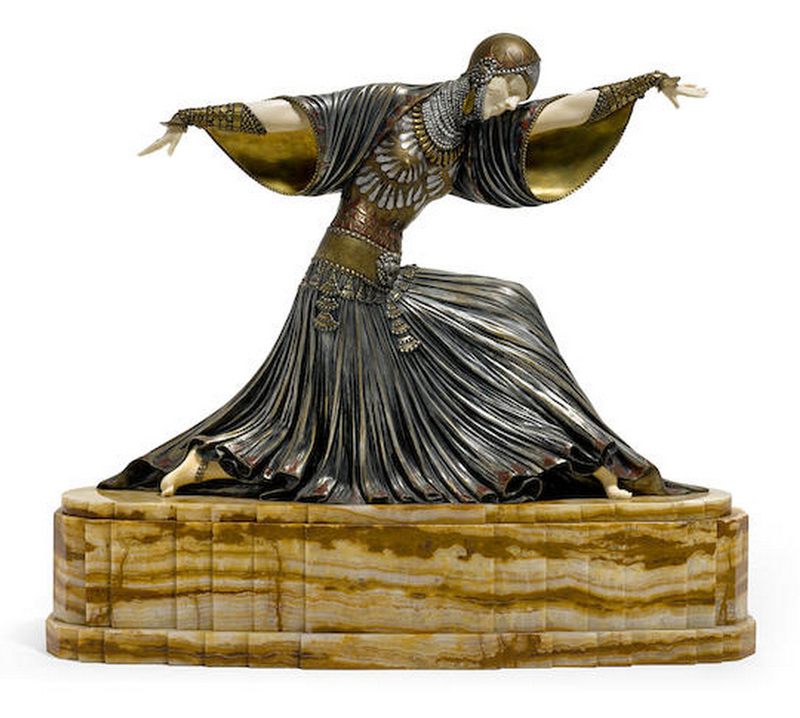 Top lot of the sale was #288, an Art Deco bronze & ivory figure entitled Thaïs by Demetre Chiparus. It sold for $185,000, including buyer’s premium — near the pre-sale low estimate of $150,000. Apparently the recent problems created by new ivory regulations did not deter the bidders. 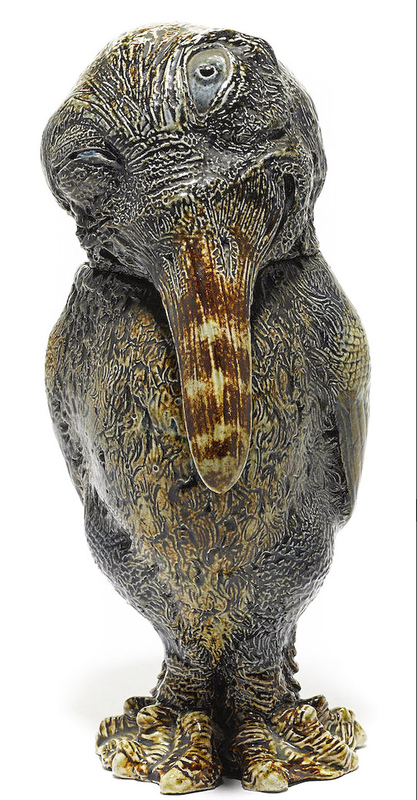 The Martin Brothers market continued strong, as evidenced by lot #224, a large (12¾”), wildly grotesque bird tobacco jar. Collectors were willing to overlook its condition problems — several chips to the head and the rim and a missing wooden base. The bird flew well beyond the pre-sale estimate of $20,000 – $30,000 to realize $50,000, including buyer’s premium. 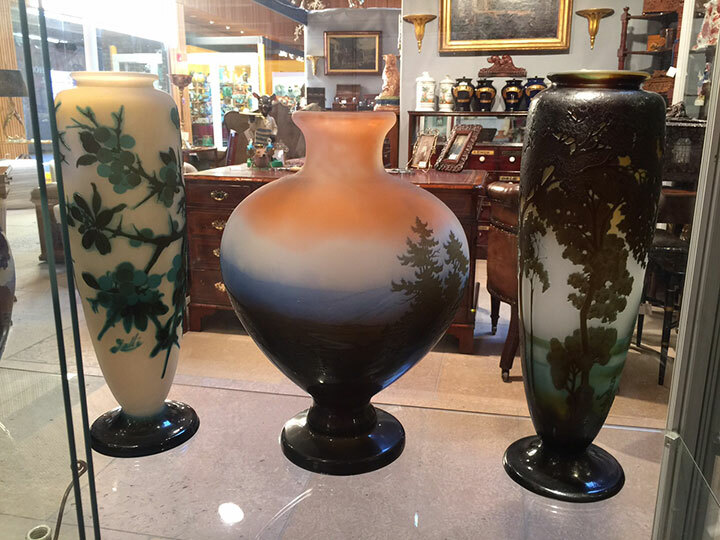 The sale began with a nice collection of Marblehead pottery from the collection of the actor, Bruce Willis. 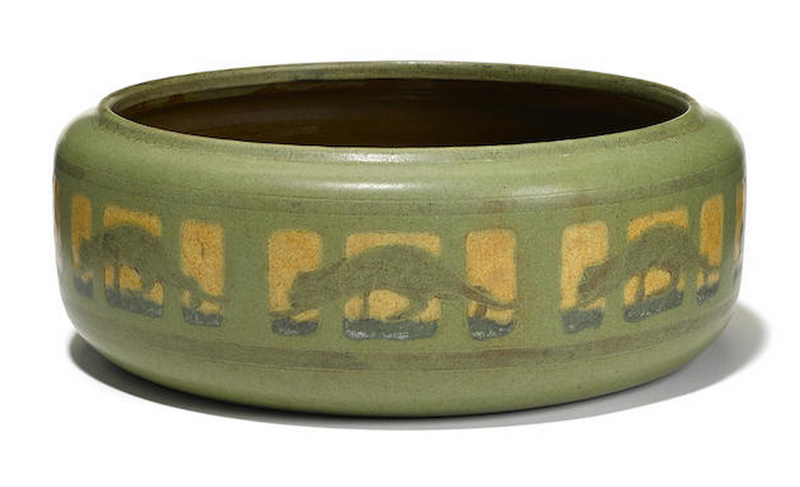 Top lot of this group was a rare Panther bowl. It growled its way almost to the high estimate of $30,000, realizing $35,000, including buyer’s premium. 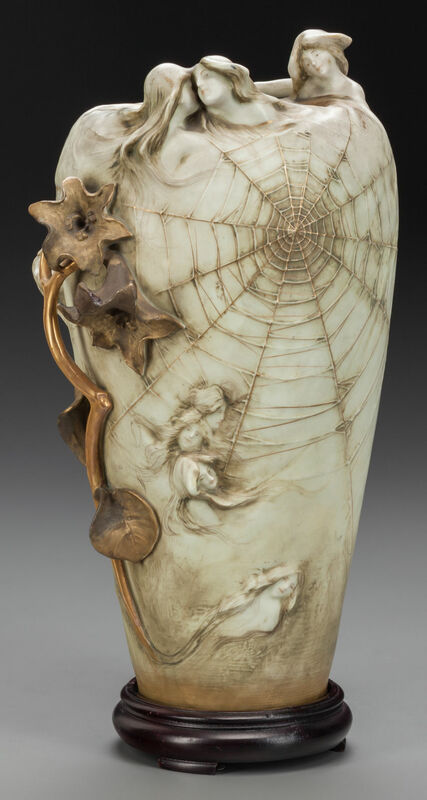 No shows until July, when we’ll be in Denver for the Denver World Wide Antique Show, at the Denver Mart, EXPO Building, 451 East 58th Avenue, July 24-26, 2015. In the meantime, we’ll be traveling in Europe. We’re sure to come up with some goodies, so keep an eye on my site for the latest additions. I’ll always be in touch, so please don’t hesitate to email or call. You may know of Alan Turing from history or the latest movie about him, The Imitation Game, starring Benedict Cumberbatch. 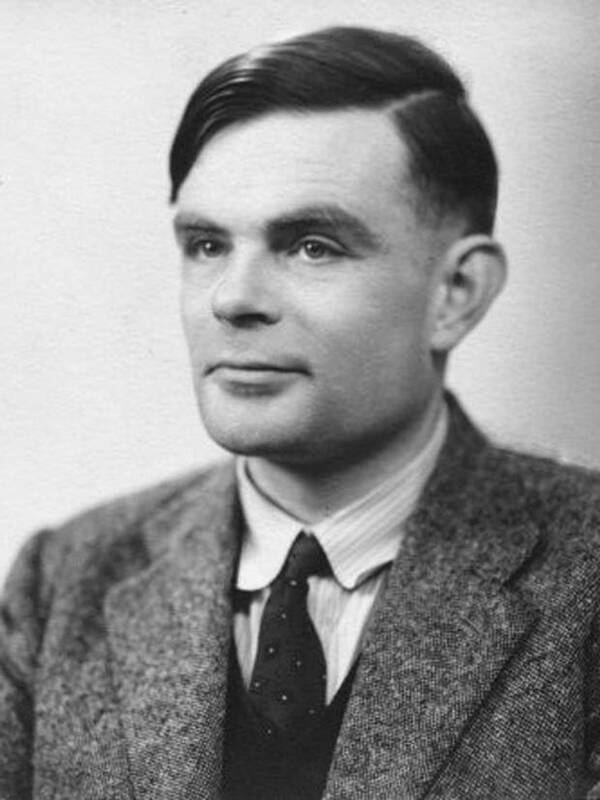 In a nutshell, Alan Turing is considered by many to be the father of modern computing. His work during WW II helped the Allies break the German Enigma codes and speed the end of the war. 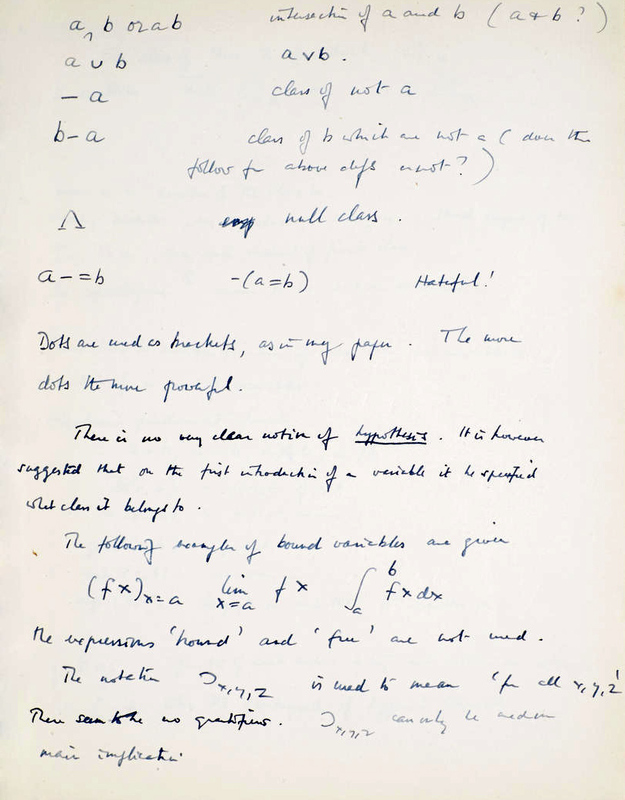 On Monday, April 13, 2015, Bonham’s New York sold an original, hand-written manuscript by Alan Turing — the only known example. The 56 pages of mathematical notes on logic were probably written in 1944. The auction house did not disclose a pre-auction estimate in their catalog, but it was available as “Estimate on request”. It sold for $1,025,000, including buyer’s premium — probably helped by the publicity from the movie. 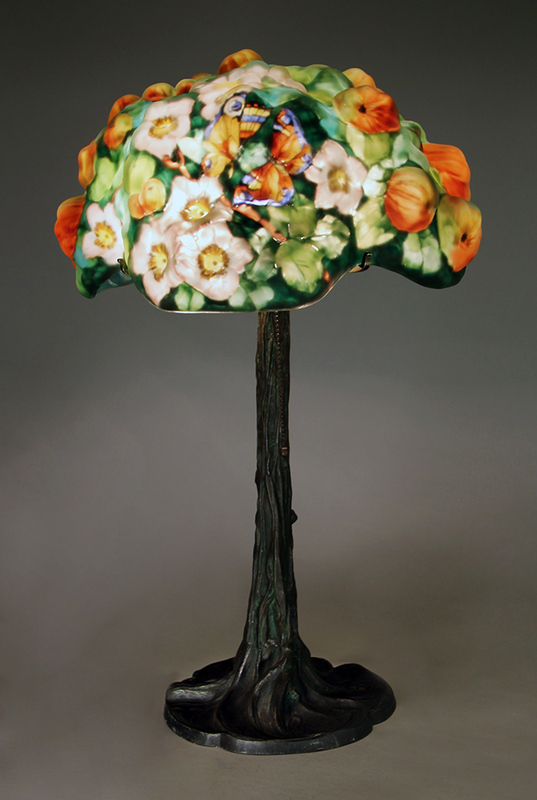 The Garden, Antique & Design Show at the Chicago Botanic Garden ended yesterday after a 3-day run from April 17-19, 2015. The show was jammed with people every day, starting early and easing up as each day went on. Attendance was much stronger than previous years, partly due to the beautiful weather, but that couldn’t have been the only explanation. This was the first year the Botanic Garden took over management of the show from Stella Show Management. They must have done something right. The preview party was held on Thursday night. You know I’m not a fan, but this one was mostly tolerable. The guests and dealers were treated equally to unlimited good food and alcohol — a biggie in my book. Some other promoters treat the dealers as second-class citizens. Attendance was excellent, with most people dressed to the nines. One of my best clients came to the preview party and made a major purchase, but I can’t chalk that up to a preview party sale because if they had come the next day, they would have made the same decision. I did however make one additional smaller sale. If the party had ended at 9 PM, instead of 10 PM, it would have been ideal. 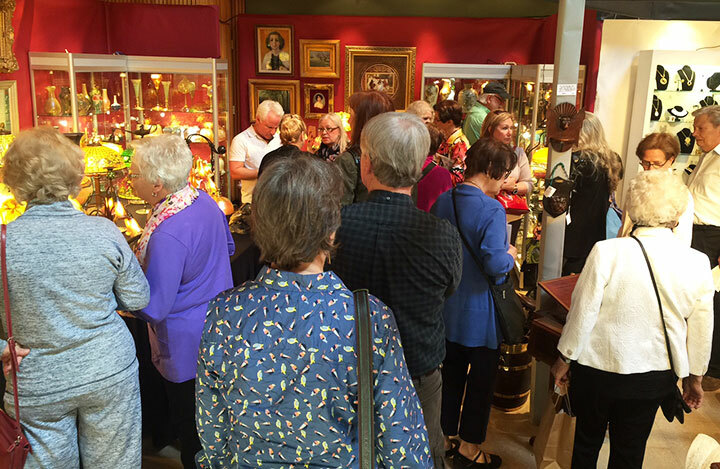 Most of our regular clients came to the show and almost every one of them made a purchase. That was great, but it was also very important to find new clients. Luckily, we did — not many, but enough to make a difference. We had a great show. 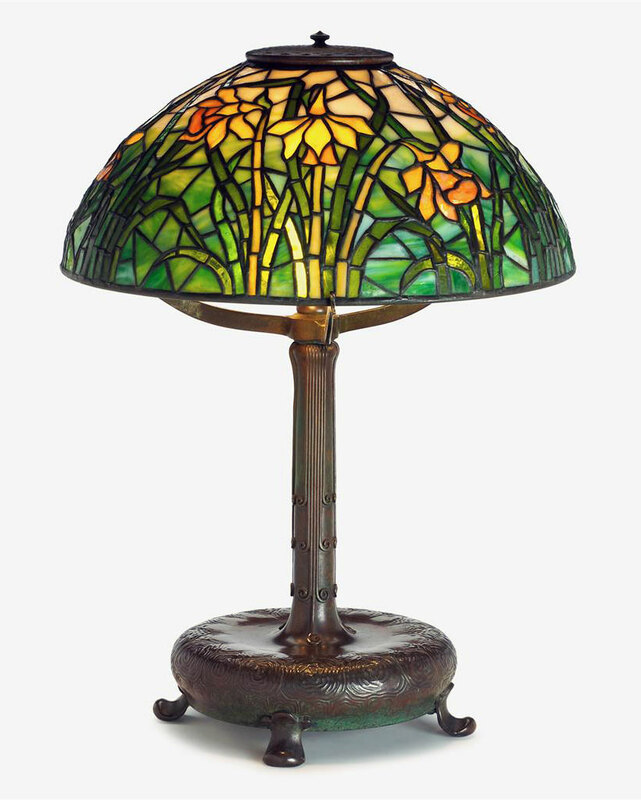 Tiffany lamps and glass and French glass sold best. A big thank you to each of you who made it happen. We won’t be back to the greater Chicago area until our Winnetka show, November 6-8, 2015. In the meantime, we’ll be traveling in Europe and getting ready for our next show, the Denver World Wide Antique Show, July 24-26, 2015. We’re sure to come up with some goodies, so keep an eye on my site for the latest additions. I’ll always be in touch, so please don’t hesitate to email or call. 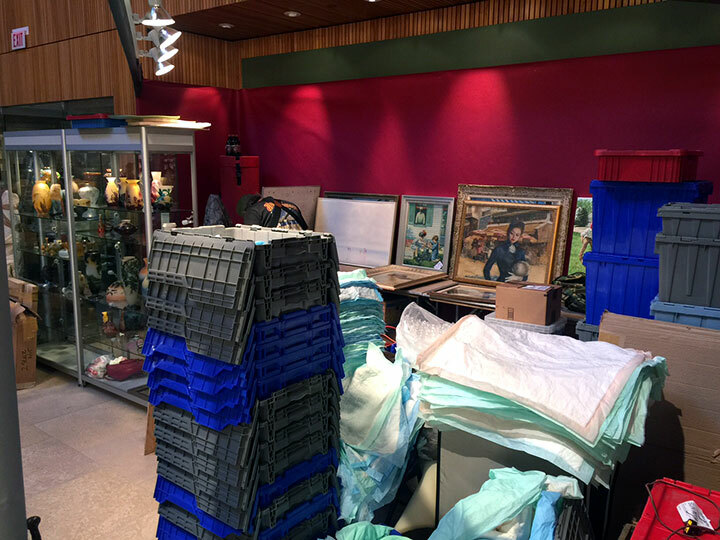 Yesterday we started setting up the Garden, Antique & Design Show at the Chicago Botanic Garden in Glencoe, Illinois. The show opens tonight with a preview party and then to the public tomorrow, Friday, April 17, 2015 at 10 AM. It will continue until Sunday at 5 PM. This is the first year the show will be under new management. For many years it was under the umbrella of Stella Show Management. I don’t know whether they left voluntarily or not, but the new promoters are the Chicago Botanic Garden itself. They’ve made quite a few changes, including not inviting some dealers back. I’m not sure how they decided but I know at least two dealers who were denied contracts who should have returned. The vetting seems to have raised the level of quality, which can only be a good thing. There were also some changes to the Garden section of the show. Personally setup went well, but could have gone even better. We were allowed to start setting up on Tuesday but didn’t know. It certainly would have taken the pressure off. The booth looks great — filled with the finest selection of French and American glass and lamps that we’ve ever offered. Please take the time to visit the show. You’ll love my booth and love the show! The Garden, Antique & Design Show opens this Friday, April 17th, at 10 AM, at the Chicago Botanic Garden, in Glencoe, Illinois, and will continue until Sunday, April 19th at 5 PM. If you want to get in sooner, you can buy a ticket to the preview party this Thursday evening. 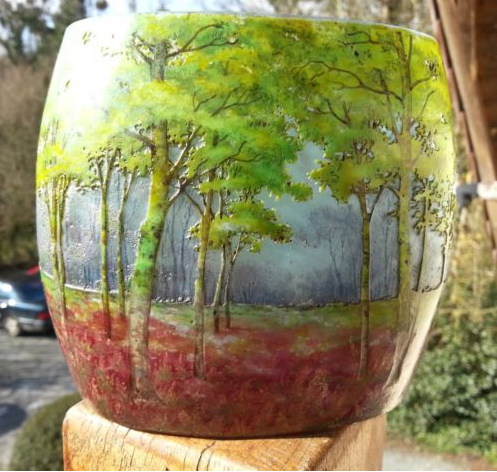 It’s a lovely show that’s different from most antique shows because it combines gardening with antiques and design. Some people attend the show only for the garden offerings and others for the antiques. 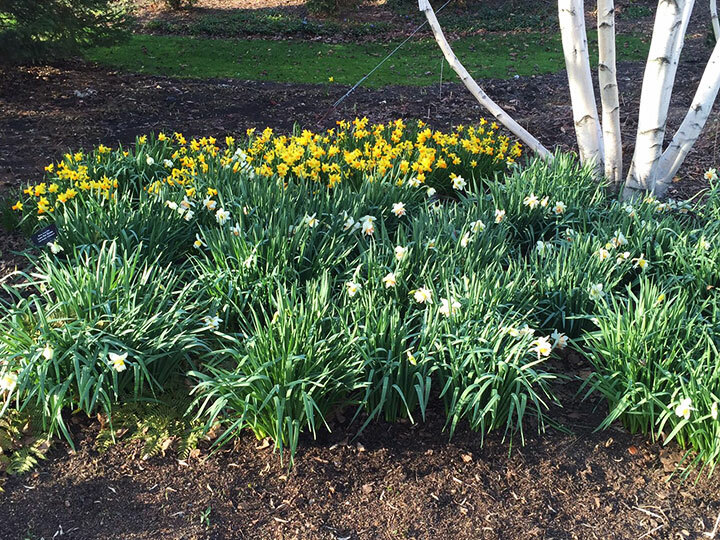 If the weather is nice, (it’s predicted to be in the low 60s), the garden will be beautiful. If you read my blog, this is the only game in town this spring. All of the other antique shows are gone, including the Merchandise Mart and the Navy Pier. If antiques interest you, I suggest you visit the show and show your support. The last thing we need is for this show to fail and have no show at all in Chicago in the spring. I’m loaded for bear. I’m bringing more lamps by Tiffany, Handel and Pairpoint than I’ve brought to any show in recent memory. 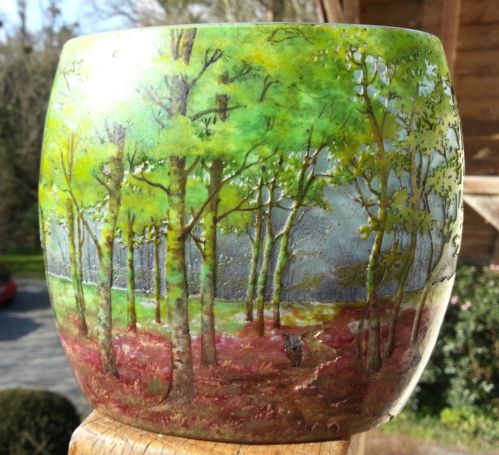 I’ll also have an incredible selection of American and French art glass, not to be beat. Come in, say hi, and be treated to a really lovely show. Many top-notch dealers will be there exhibiting. 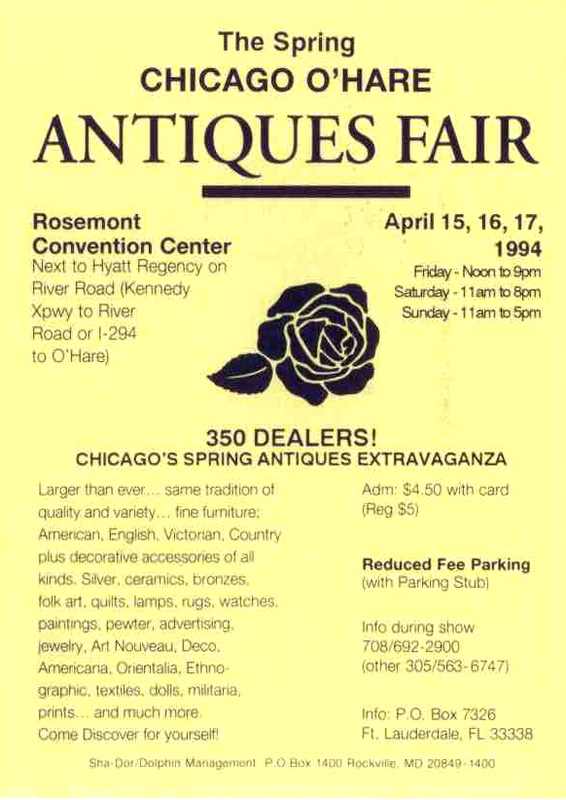 I was cleaning up some old papers when I came across a show announcement for the Chicago O’Hare Antiques Fair from April, 1994. The show was advertised as having 350 dealers, but that probably included some exaggeration. 250+ was more like it. The show took up all of one of the larger halls at the Rosemont Convention Center. 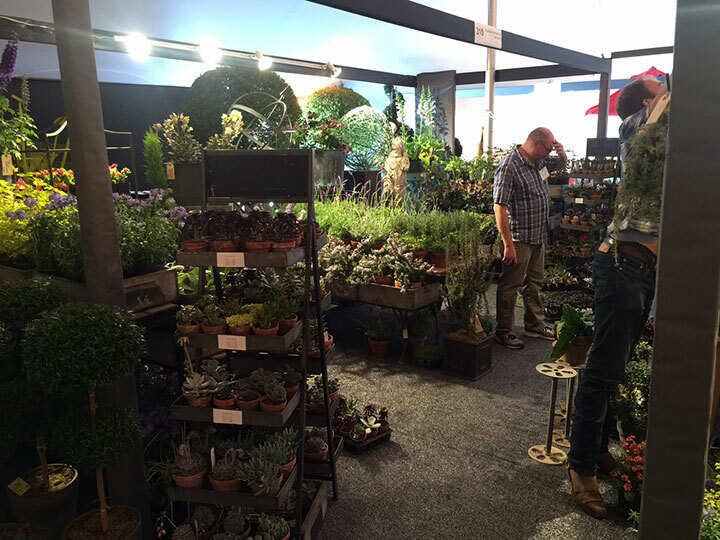 Over the years, as it got smaller, the show was moved to one of the smaller halls, but finally there weren’t enough dealers, so the show failed a couple of years ago. Oh well! I really miss that show. Boy, have times changed. Today, not only does the show not exist, but most of the shows in the greater Chicago area are gone. 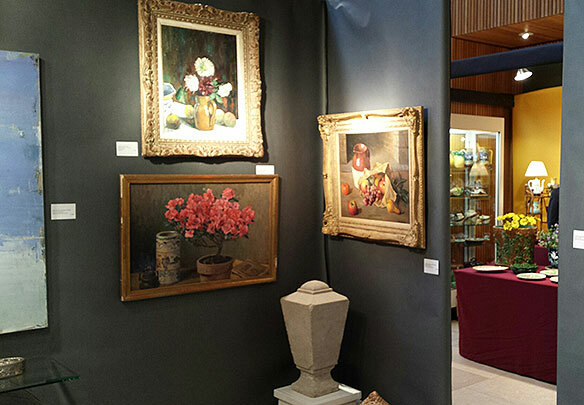 There are only two left, the Antiques + Modernism Winnetka show in November and the Garden, Antique & Design Show in Glencoe next week. There isn’t a single show left in the city of Chicago, but I hope that will change. The Palm Beach Show Group still lists Chicago as one of their cities, with a projected date of Spring, 2016. 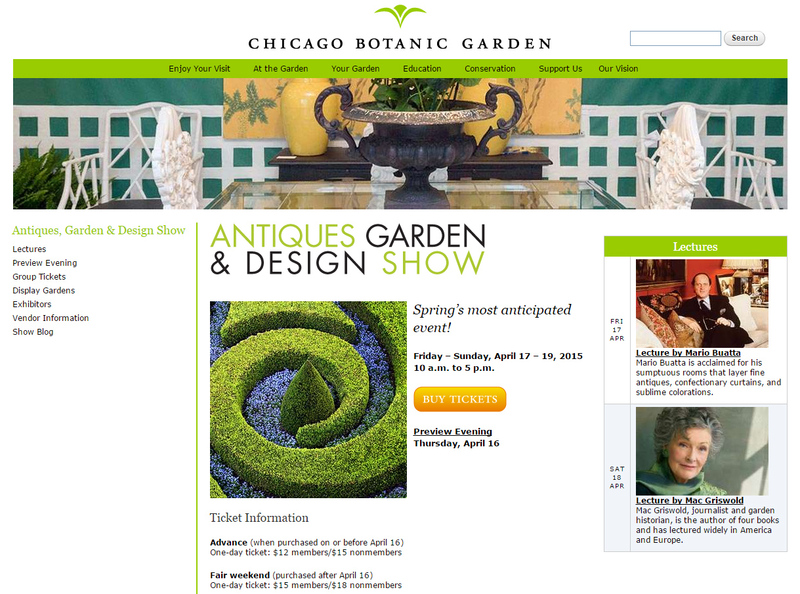 If you don’t want either of the two remaining shows to fail, I suggest you support them by visiting next week’s Garden, Antique & Design Show at the Chicago Botanic Garden in beautiful Glencoe, IL, a north suburb of Chicago. The weather is projected to be in the 50s and 60s all next week, so the gardens should be in bloom. 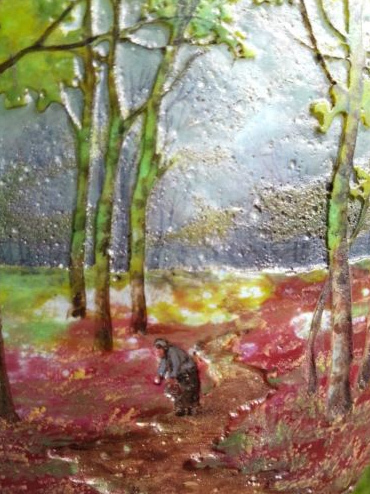 The show combines both antiques and garden, for a delightful mix that doesn’t exist at any other show I know of. 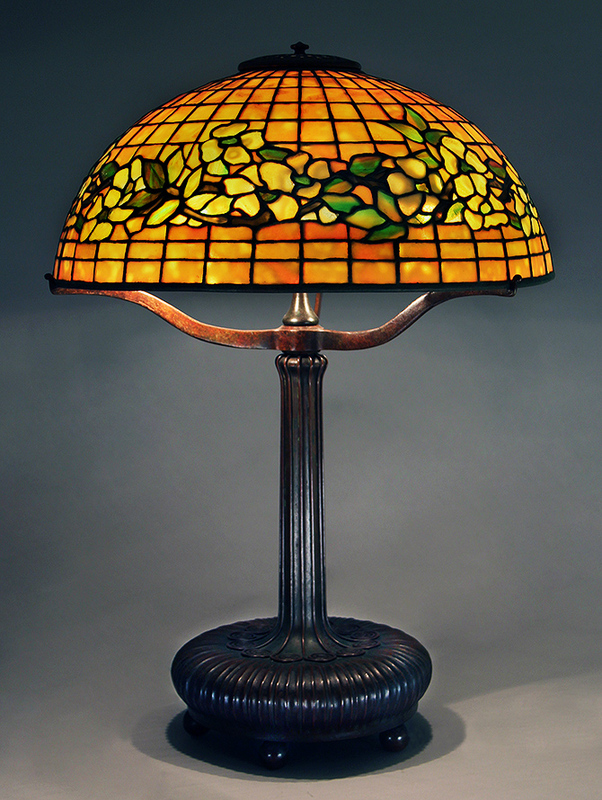 We’re bringing a truly vast assortment of American and French glass and lamps plus important miscellaneous items. The buying has been good, so you’ll like what you see. The show opens to the public on Friday, April 17th at 10 AM and runs until Sunday, April 19th at 5 PM, with a preview party on Thursday night. I’m looking forward to seeing you!